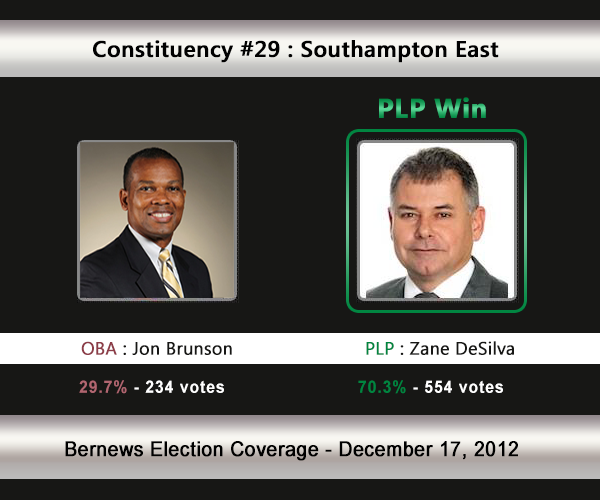 The PLP’s Zane DeSilva moved from Constituency #30 Southampton East Central to stand in this area, and he will be challenged by the OBA’s Jon Brunson. The incumbent is the PLP’s Stanley Lowe, who is retiring after serving for decades. In 2007 Mr Lowe won 67.97% of the vote vs the UBP’s Douglas Decouto [558–263]. In the 2003 General Election, Mr Lowe won with 71.82% of the vote against Cal Simons [UBP] who received 28.18%. 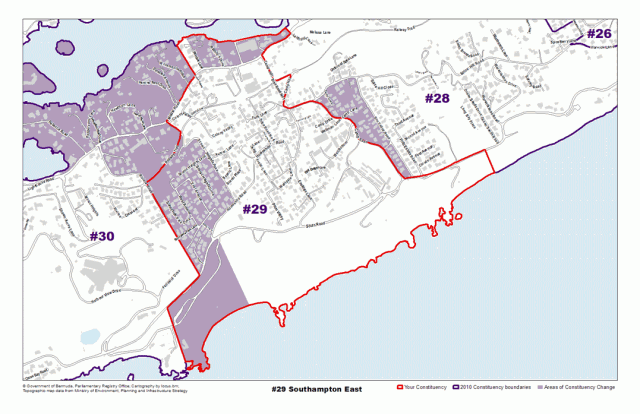 The areas Southampton East consists of, or is located by, includes: as follows: Middle Road, Plumber Lane, Camp Hill, Spice Hill Road, Sun Valley Road, Horseshoe Road, Scenic Heights Pass, Riviera Road and more. In December 2009 he was appointed Minister Without Portfolio and worked closely with the then Premier on prospective hotel developments. He was instrumental in the passing of the Municipalities Amendment Act in 2010. He acted for numerous Cabinet Ministers between 2009 and 2010 and was appointed Minister of Health in November 2010. In that year, he held Bermuda’s first ‘Health Financing Summit’. In 2011 he unveiled the ‘National Health Plan Consultation Paper. He has oversight of Bermuda’s first Public Private Partnership (PPP) for the new hospital; Bermuda’s largest construction project. Mr DeSilva is President & CEO of Island Construction Services Ltd. (simply known as “ICS’ in Bermuda) which holds the position of one of Bermuda’s largest and longest established construction companies. He was trained within the business holding various positions eventually ascending to the position of President in 1992. Since then he has been instrumental in the growth and diversification of the company to its present position as one of Bermuda’s largest locally owned and operated companies. A keen sportsman, he is a Life Member of Watford Sports Club, Somerset Bridge Recreation Club, St. David’s Cricket Club, East End Mini-Yacht Club and the Bermuda Athletic Association. His sporting achievements include representing Bermuda in Track & Field (Cross country), in Snooker at Golf World Championship in Venezuela in 1994. He is married and he and his wife have two children. Jon Brunson’s family has deep roots in Southampton. His grandfather was the owner of Ryan’s Restaurant at the top of Camp Hill and the Old Top Hat vegetable cart at the foot of Camp Hill. The family homestead is still on West Dale Lane. Jon served in Parliament for almost six years as the MP for Southampton West, but took a break in 2009 in order to devote more time to his family and business responsibilities. His children – a 21-year-old daughter and an 18-year-old son – and their future are the key motivators in his decision to return to politics. “I’ve never seen conditions in Bermuda as difficult as they are now. The deterioration of our social structure is there for all to see – homelessness, fewer jobs, unemployment, crime, gangs, a faltering economy and an education system in need of real reform. Even people who have a good education and professional degrees are out of work, or are forced to work well below their potential. “I feel that I have to be part of the change that Bermuda needs to ensure that our children have good opportunities and a future that every parent would wish for. What does Jon Brunson bring to Bermuda and to Southampton East? “Helping people and giving back is what I do. I’m a director of SCARS – Saving Children and Revealing Secrets. I serve on the Vestry of St. Anne’s Church in Southampton. I was a director of The Learning Disability Association of Bermuda as well as Orbis Founders Philanthropies, a programme whose aim is to provide educational opportunities to young black Bermudians who demonstrate academic excellence and a potential to contribute to Bermuda, but who need financial support. “In 2008, I served on the Parliamentary Joint Select Committee on Education, which reviewed the Hopkins Report and recognized the real need for reforming our public education system. We have many excellent teachers and principals in our system, but in spite of their strong commitment there is much work to be done to ensure that our system provides our students with the skills and training they need to get good jobs and develop rewarding careers. We can’t afford to have any more wasted talent. I fully support the OBA’s plans to implement a fully integrated technical and vocational curriculum starting at middle school and continuing through Bermuda College. I also believe we need to extend the school day to provide more time for sports, music, arts and extra help for those who need it. I believe this will help support families as well. “Sports have always been an important part of my life and in my experience can help teach young Bermudians important leadership and teamwork skills. I have been an enthusiastic participant in the 24th May Marathon Derby, as well as the ironman triathlon, tennis, field hockey, football, softball, cycling and squash. “The OBA is a strong team and I believe that my experience in both international and local business will help the OBA restore economic confidence in Bermuda and stimulate investment and good jobs for Bermudians.